So much to watch and so little time! Because me travel calendar has me on the move this week, I wanted to quickly share three entertainment options for this weekend and look at the "beachballs" (positive features) and "jellyfish" (things to watch out for) in each. Airing Sundays on CBS, the new episodic drama God Friended Me will be a regular on my DVR. That's a bit unusual for me, as I don't watch a lot of these types of shows. But this show combines a few of my favorite things: God, social media, and an ensemble cast that immediately draws you in with their chemistry. The premise examines some classic "prodigal son" elements with a modern spin: Miles Finer (wonderfully played by Brandon Michael Hall) is a self-professed atheist podcaster, but also the son of respected minister Rev. Arthur Finer (Scandal's Joe Morton). When Miles receives a Facebook friend request from God, he thinks he's being catfished or punked. But before long, we discover with Miles that there may be something more mysterious involved. I give God Friended Me "beachballs" (positive love) for an engaging storyline that looks at faith through a prism that permits us to ask big questions but "jellyfish" (not so much love) for a few plot points that were too neat and quickly handled. If God Friended Me can try to do a bit less in future episodes but do it more tightly, I'll be its friend for a long, long time. If you loved Spellbound as much as I did, I recommend that you immediately RUN to a theater near you to see Science Fair. 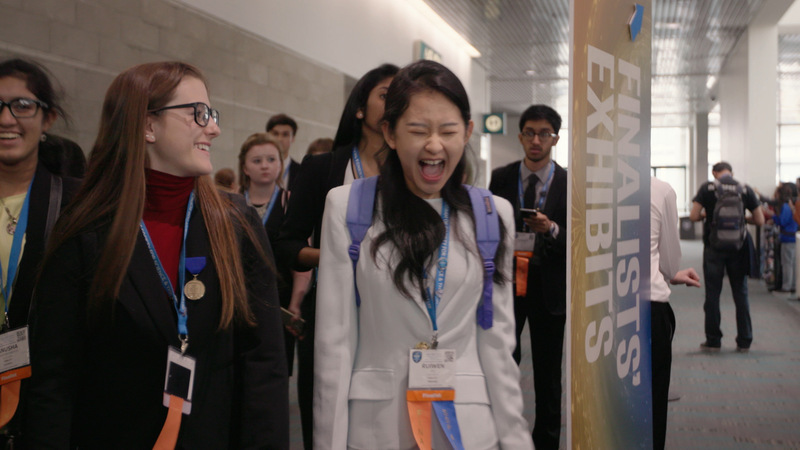 This quirky, hilarious, compelling documentary weaves the stories of nine high school seniors as they pursue their ultimate goal: a spot at the International Science and Engineering Fair. I watched this film with my husband, a physician, and we both marveled at the genius of these committed students. I won bragging rights when I accurately predicted which intellectual giant would ultimately win the big prize: a huge scholarship from Intel and worldwide geek street cred. There's so much to love about this film, but most compelling for me was a look into the passion that these teens feel for the incredible work they are doing. As a parent of a national academci decathlon champion, I appreciated the fact that for these teens, this one week of the year means not only the chance to excel intellectually but also the happy opportunity to socialize with friends whose brains are wired the same way. The Science Fair dance scenes were a fun compliment to the many looks at the brilliant projects the students undertake. There was very little helicopter parenting here, but we do meet one committed educator who gives us a perspective on how much care goes into positioning the minds who will innovate our future. "Beachballs" for the teens and their drive. Try as I might, I couldn't find a single "jellyfish", but some parents may want to prescreen this before watching with younger children. On the surface, Smallfoot is a Warner Bros. animated romp through the lives of a Yeti community living high atop a mountain in the Himalayas, safe from the "smallfoot" (human) creatures they've been taught through a codified system of rules and teachings to dread as their mortal enemies. Life is just fine in the village until one loveable Yeti, Migo (Channing Tatum) has a chance encounter with an actual smallfoot Percy (James Condon) and begins to ask big questions about everything he's ever been taught. Along with a group of skeptic friends headed by Meechee (Zendaya), Migo goes in search of and ultimately discovers some life-changing answers. I screened this film in a theater of delighted children who laughed uproariously, sang along and seemed to thoroughly enjoy the film. But parents may want to dig a bit deeper into a few trusted reviews (try Family Theater Productions, Catholic News Service and Plugged In to start). I give Smallfoot beachballs for awesome production values and fabulous music, especially Zendaya's incredible song "Wonderful Life". But watch out for some jellyfish including too much potty talk, some scary moments and a subtle message about organized religion. I'll conclude this wrap up by saying that there are things to love about each of these three viewing options, but if I could only watch one today I'd make it Science Fair. If you have a chance to view any of them, I'd love to hear from you! CBS, Movie Reviews, Movies, National Geographic, Television, Warner Bros.